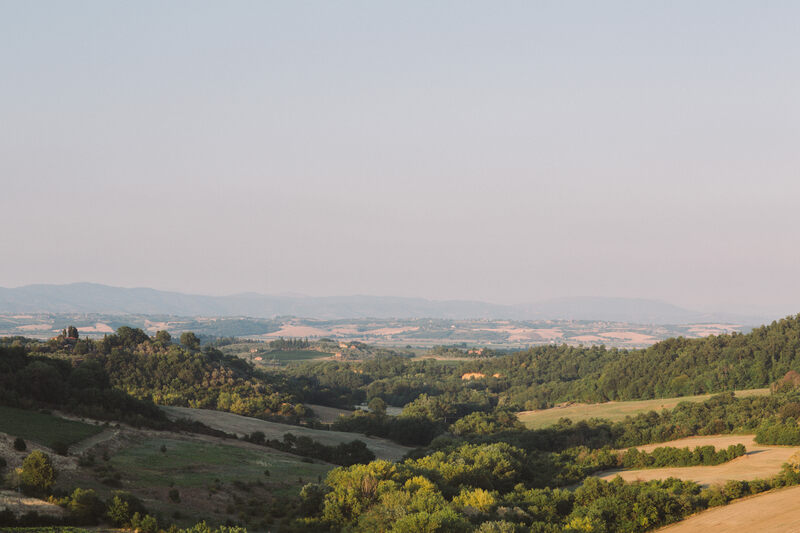 Sofie and Martin, who I knew when they both lived in Australia, decided to have a symbolic ceremony for their family and friends in the gorgeous Sienese countryside. 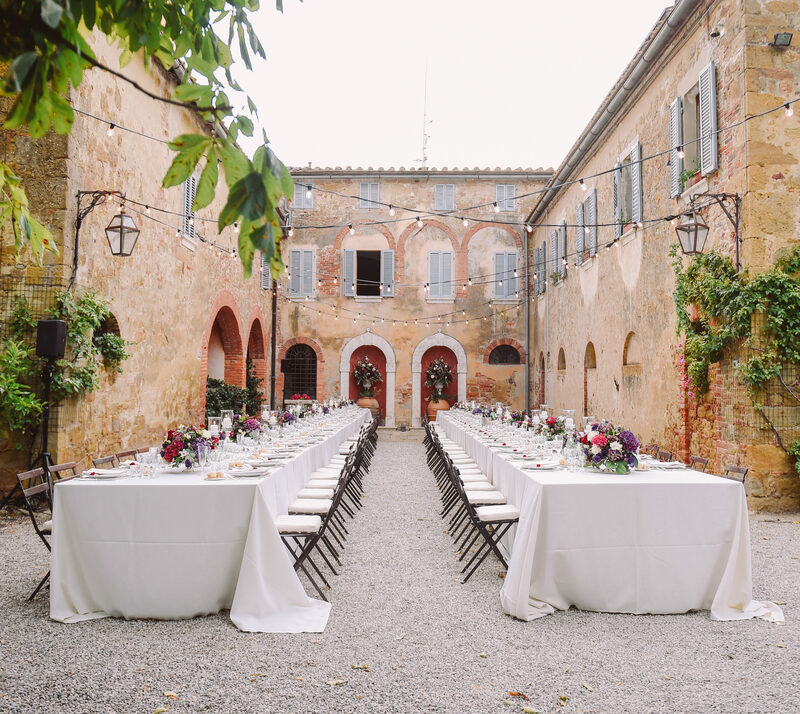 Sofie, an interior designer from Germany and Martin a German Import Manager from Canada wanted to share their magical union with loved ones in the idyllic village of Borgo Sant’Ambrogio where the rustic ambiance and grand views of the countryside are beyond compare. 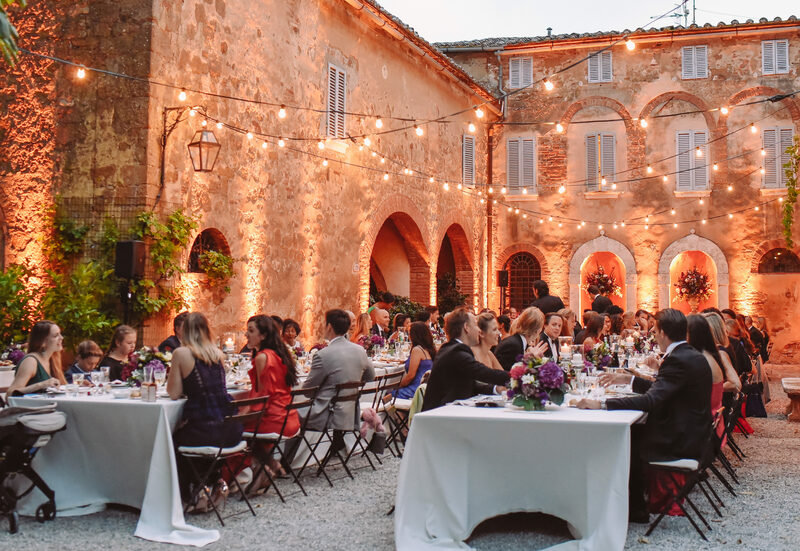 What better place than Tuscany to celebrate the best day of their lives while giving their guests a chance for a holiday filled with joyful memories together. 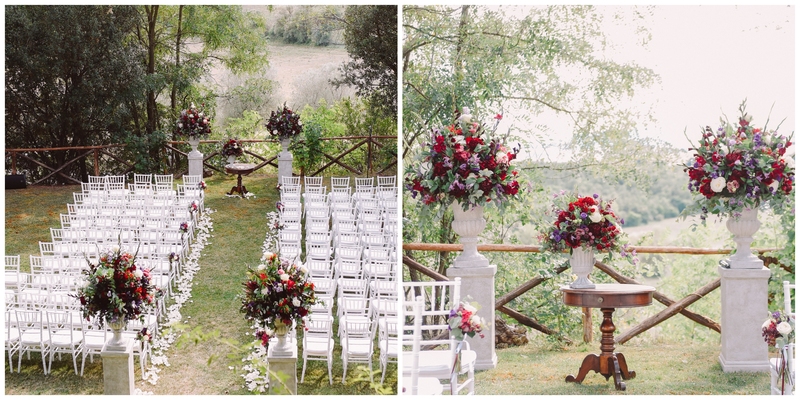 Borgo Sant’Ambrogio is a quaint village which Sofie and Martin fell in love on first sight. 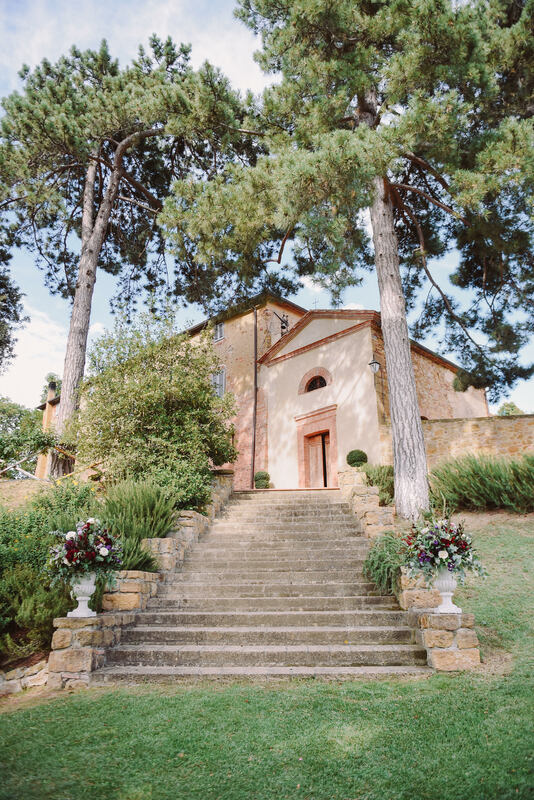 The Sienese countryside borgo is like taking a step back in time with a beautiful and distinctive courtyard of the stately home with a lovely church once used by the farmers who worked in the nearby lands in the village. It is resplendent with charm and ambiance! 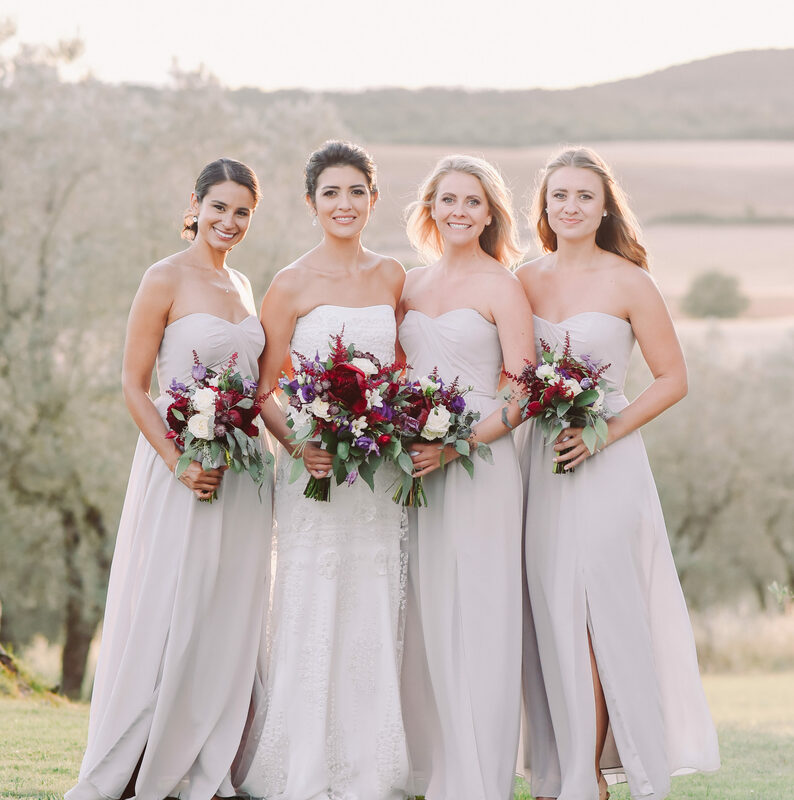 The bride wanted to create an atmosphere of simple elegance that shone through in every detail using the backdrop of terracotta and olive green as the canvas while adding color with the most gentle of strokes. The bride made herself ready in Bagno Vignoni at Hotel Adler famous for its thermal waters. The symbolic ceremony was held on the roof garden in the shade of ancient trees. 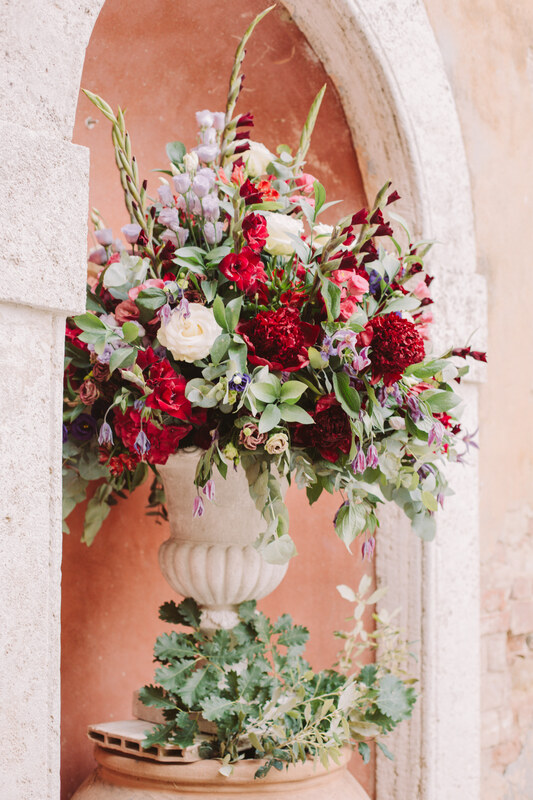 We brought in floral arrangements with hints of burgundy and lavender to highlight the couple and compliment the lush surroundings. Sofia chose a small bouquet with exquisite yet simple flowers whose beautiful color created an impact. The reception dining consisted of two long tables in the imperial court of the village. 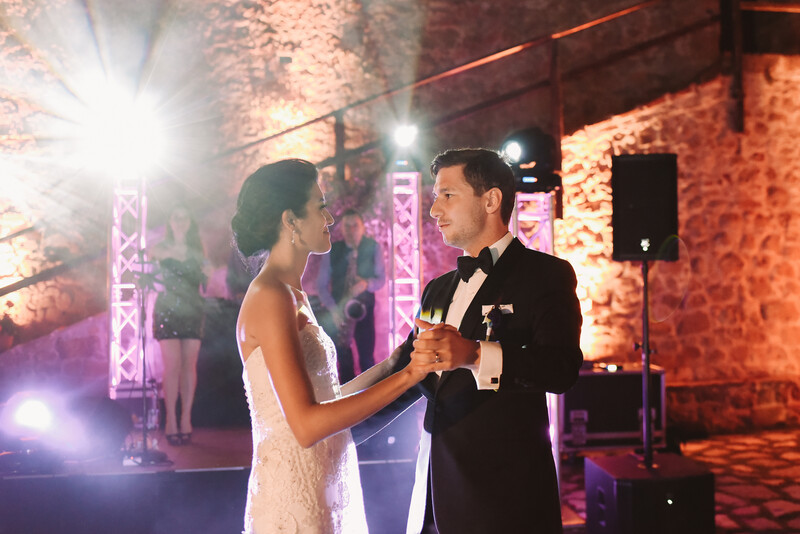 As the sun set, the court turned into a uniquely magical place with perfectly placed lighting consisting of strings of bare bulbs and architectural illumination on the walls. What is a celebratory dinner without dancing! The village square was arranged with DJ and singer setting the mood with the first dance. 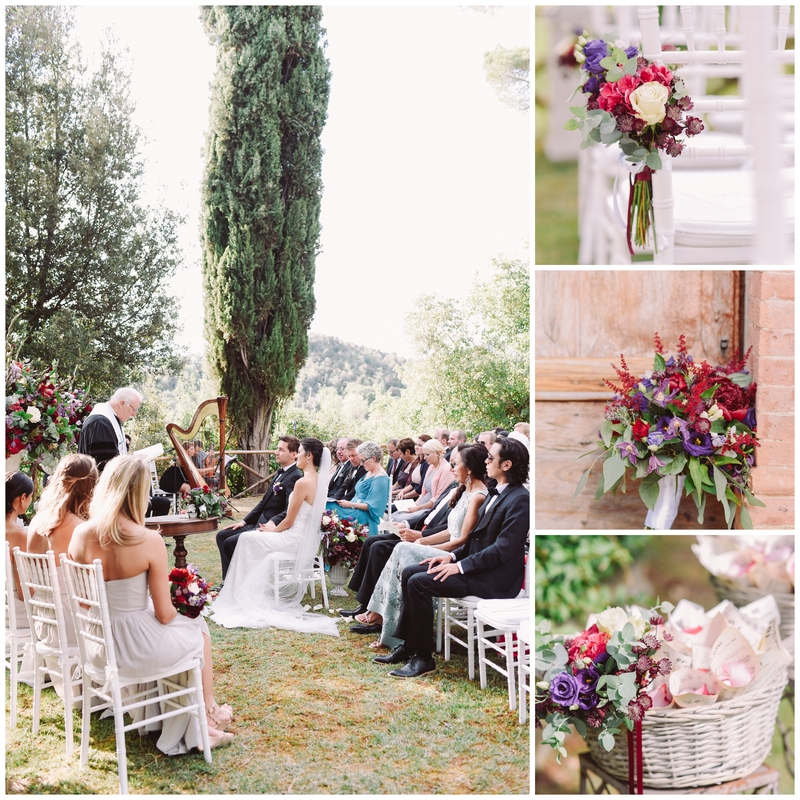 The palette: Burgundy, white, olive green and lavender consisting of marvelous, soft compositions that complimented the rustic and romantic venue. Above all, however, we are grateful to you beyond words for ensuring that every program of the weekend went smoothly - the weekend was packed with events and there was not a single hiccup or hitch!!! There are no words to describe how happy we are that we chose you to plan our wedding... I felt like Cinderella and you were my fairy godmother!! 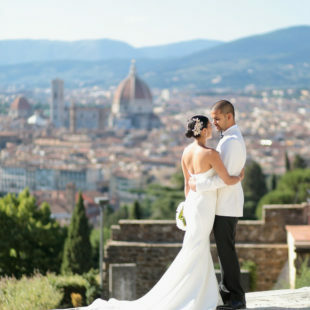 The first thing we did when we decided we would like to get married in Italy, was find and contact Alessia B Events and we are so glad we did. A huge thank you to everything you have done for us over the past 18 months. We had a truly amazing wedding, everything was perfect and you were a pleasure to work with! Thank you for all you did to make our Italian wedding adventure special and perfect. From tours to the villa to the musicians and photographers, everything was perfect and would not have happened without you! The wedding was fantastic. Everyone loved it. The food was lovely and so were the flowers. Thank you a thousand times for your help and patience and everything. I couldn't have done it without you. We just returned from our honeymoon! I want to thank you from the bottom of our hearts for all the work you did to make our wedding day so special and magical. Everything was like a dream and ran so smoothly thanks to you. I wanted to have a special birthday party. I wanted more of a show, an event, something important. Alessia managed to bring my ideas to reality. Thank you, Alessia for that magnificent evening.